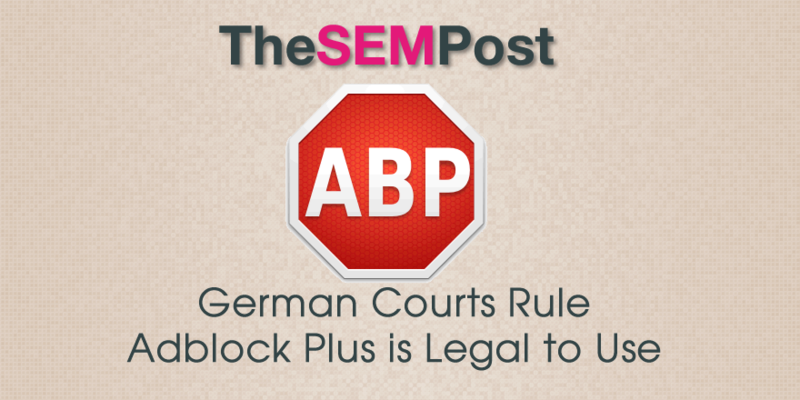 Online publishers in Germany have lost a lawsuit against the German company responsible for creating Adblock Plus, stating that the company should not be allowed to block ads from being served on their websites. The two publishers, Zeit Online GmbH and Handelsblatt GmbH, were running advertising on their sites Zeit.de, Handelsblatt.com, and Wiwo.de, but felt their revenue was unjustly hindered due to the usage of Adblock Plus by their site’s visitors. Instead of asking their visitors to whitelist their sites to support them, like many publishers do, they decided that they would sue Eyeo to have adblocking declared illegal. German courts sided with Adblock Plus, agreeing that users should be able to control what appears and what does not appear on their computer screens, through the use of Adblock Plus or any other similar program. Adblock Plus is currently used by over 50 million users to block all advertising from being displayed on websites. There are some sites whitelisted by default – most notably Google – but the majority of sites will display whitespace instead of loading an ad on the page. The plaintiffs (the parties that sued us) are Zeit Online GmbH and Handelsblatt GmbH. These companies operate three websites: Zeit.de; Handelsblatt.com; and Wiwo.de. The defendant is Eyeo GmbH (which is the company that administers Adblock Plus). The lawsuit charged that we should not be allowed to block ads on websites owned by the plaintiffs. They sought what is known as injunctive relief (which is called “Unterlassungsanspruch” in German). The Hamburg judge ruled against the plaintiffs and in favor of Adblock Plus, upholding the right of Adblock Plus users everywhere to continue to block annoying ads and protect their privacy. I do think Adblock’s idea of creating non-obtrusive ads that users won’t hate is a good one. I only recently installed Adblock myself, and it was simply because of the huge increase in the number of auto-playing video ads that randomly start playing – usually loudly – when you load a webpage. Now that the legalities are out of the way, we want to reach out to other publishers and advertisers and content creators and encourage them to work with Adblock Plus rather than against us. Let’s develop new forms of nonintrusive ads that are actually useful and welcomed by users; let’s discover ways to make better ads; let’s push forward to create a more sustainable Internet ecosystem for everyone.